Last week, during spring break, my daughters (juniors in high school) and I toured three local universities. 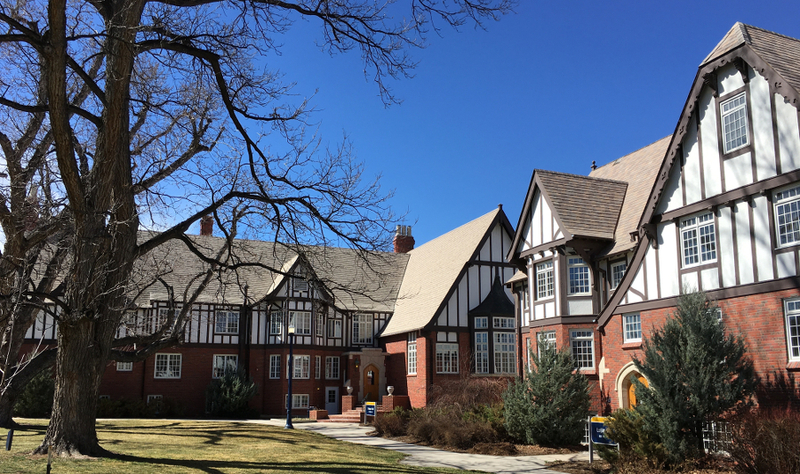 Our first stop was at the University of Northern Colorado where we were captivated by the architecture, especially that of the four Tudor Revival style residence halls called Presidents’ Row. As soon as I first saw them I knew I’d want to dig a little deeper to learn more. It’s clear that a lot of attention to detail was used when building these apartments. The first of these buildings was constructed in 1930. The stock market crash in 1929 almost halted the project, but a school trustee, Charles N. Jackson, purchased a large chunk of bonds which enabled the development to move forward. A second building was added in 1936, a third in 1940, and a fourth in 1947. These buildings were known collectively as the Faculty Apartments until October 1, 2005 when they were renamed Presidents’ Row and each building was given the name of a president of the school: Brown, Luján, Dickeson, and Bond Halls. Along with the name change, the use of the buildings shifted to becoming residence dorms. And old photo of the Faculty Apartments from the UNC website. Characteristics of the Tudor Revival style include steeply pitched roofs, exposed woodwork (also called half-timbering), tall narrow windows with many small panes of glass (or “lights”), and decorative gingerbread along the edges of the gables (also called bargeboard). These apartments include all of these features. There are also rounded doors, brickwork, and chimneys that add to the overall style. A photo of the Faculty Apartments as found in the Denver Library Archive. The photo was listed as being taken between 1948 and 1960. Call number CHS.X7572. These buildings are real gems and worth checking out if you’re in the area. They’re located on 19th Street near the intersection of 9th Avenue. Information on the construction dates for the Faculty Apartments, as well as the date of renaming the buildings, was found in this UNC chronology. The tenuous origins of the first building right after the market crash came from a page on the history of the Buildings & Grounds in Central Campus as did the third picture down. 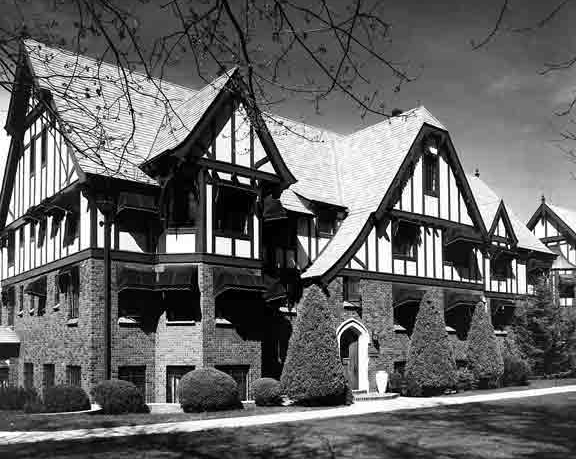 To find out more about Tudor Revival architecture, check out Wikipedia, which gives a nice overview with several pictures from all over the world.